I'm a certified Avid Pro Tools user (Operator: Music), and wanted to give MC|F a try, as a possible replacement to Adobe Premier. Unfortunately, the program quits unexpectedly at launch when initializing AMPIPluginDSM.avx. Removing AMPIPluginDSM.avx from the MC|F package allows the program to run, but with "limited audio capability." Other than stock plugins, I use several from FabFilter, plus RX6 Advanced (all of which are up to date). Pro Tools 2018.4 runs with no problems (I use it daily). Can someone point to some specific troubleshooting steps? I'm having the same issue. When it occured in MC:F 2018.3, i would just try and launch it again. It would start up correctly after two or three attempts. But it seems to have gotten worse in 2018.4 (i am now using the regular MC though - but the loader codebase should be identical i think). It also appears to occur less when there are few plugins in AVX2_Plug-Ins. This is anecdotal though. Everytime I start it without exception. Gave up on on trying to use it and bought FC 10 Pro. Just downloaded 2018.4 hoping it was fixed but still bombs out with Ampiplugindsm.avx error. Mac Pro 2013+ 12GB ram 3.7GHz quad core xeon E5, AMD FirePro D300 2048 MB. Latest high Sierra with all updates. Allen and Heath QU32 desk. Nothing else much installed and Protools working great. I think my MAC is at the bottom end of the spec for MC but this looks more like a bug that a spec problem and FC x Pro works like a dream apart from it's poverty spec Audio subsystem. same in MC First and full version. Sadly, MC|F still fails for me, even with an empty AVX2_Plug-ins folder. Yikes. This doesn't bode well for my test! I'm not giving up yet, but this doesn't make me feel much better. Gave up on on trying to use it and bought FC 10 Pro. I may end up like you. I downloaded the trial, but haven't activated it yet. I was really hoping to love MC, but it will be hard to if I can't launch it! It sounds an awful lot like this is a bug in AMPIPluginDSM.avx. I am seeing the same issue in 2018.5 on the regular (non-|First) version as well. Speaking of which, and I am sure I am being daft, but how do I go about disabling/deleting this plugin? I went on a quick hunt through the Media Composer package and the application support folders but turned up nothing. First, I assume you are co-installing as you have PT and now MC First on the same system. Make sure you check the latest MC First ReadMe - I attached it - as there are specific co-install instructions. Do you have any of these installed for PT? I had the same problem with MC 2018.5 and it crashing when loading pluggin ACFString.avx. Moving the AVX2 folder worked and now MC opens. My question is - do I now leave the AVX2 folder on my desktop? Whoa, hold on, are you saying the WAVES is now a problem for Media Composer? I've been using those plug-ins for years. Should I go back to MC 2018.4 to stop the crashing? Anyone found any cure for this? 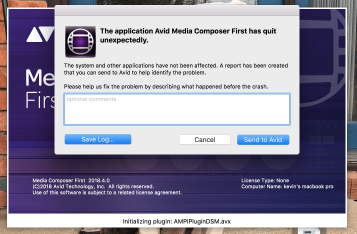 Installed Pro Tools yesterday, and now Media Composer won't start, unless I remove AMPIPluginDSM.avx from package. Also tried to remove the AVX2_Plug-ins folder. The DSM.avx process is responsible for licensing and validating the audio plugins (including AudioSuite) within Media Composer. If for some reason the process can not start successfully, you may receive the AMPI error. Did you by chance read the co-install notes for using both MC and PT on the same system? What version of High Sierra as well are you on? Do you mean "ReadMe for Media Composer® | First v2018.5"? I found it now in your post above. So in this case there is no difference between MC First and regular MC? 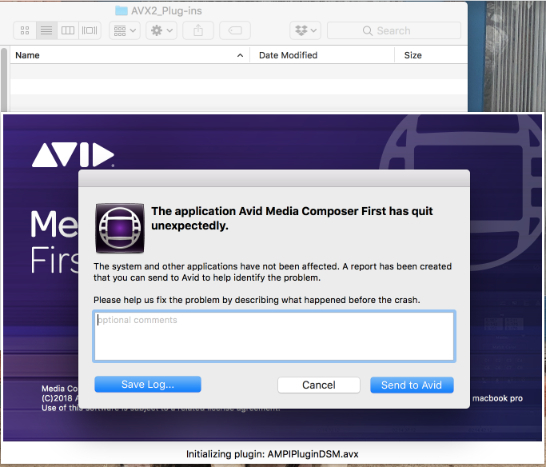 If you run into any issues, uninstall both applications and reinstall Pro Tools first, and then reinstall Media Composer | First. When you uninstall Pro Tools, choose to uninstall just the application and not the audio drivers or the editing application no longer sees the devices. The second is the install order and between MC and MC First they are the same as far as co-intall goes.